Six Dice is a dice game known by many other names, including Ten Thousand, Zilch and Farkle. It is a simple game where players try to score by getting certain combinations on the dice. Combinations are worth set points and players try to race to be the first player to earn 10,000 points. Its rules are highly adaptable and simple to understand. Players roll all six dice during their turn. Decide on the order of play by rolling one die. The person with the highest roll goes first. Players throw the dice and count their score. If they have non-scoring dice left, they can roll these dice again. As long as they keep rolling scoring dice, they can keep rolling. If all six dice can score, players can then throw all six dice again. Players can stop at any point, after scoring in the first time (see special rules) and take their points. If players throw a roll that does not generate new scores, they lose their turn and the points earned in the hand and the next player gets a chance. Play continues until somebody scores 10,000 points. Scoring in six dice can seem complex but there are really only a few specific rules. Each rolled one is worth 100 points while each rolled five is worth 50. Three ones are worth a quick 1,000 points. Three of any other kind takes the dice value and multiples it by 100. For example, three twos would equal 200 points. Players score 3,000 points for rolling a one, two, three, four, five and six in one roll. Three pairs score 1,500 points. All special scoring combinations must be thrown in one roll in order to count. For example, if a player rolls two ones and then rolls another one, he scores 300 points, not 1,000. Likewise, a player who rolls two fives and two ones and then rolls two sixes on the next roll doesn’t score for two pairs, but just for the two fives and the two ones. There are a few special rules players can either add to the basic game play or ignore if they don’t feel like an extra challenge. For example, players who haven’t scored yet must roll at least 500 points in their first scoring attempt. Afterward, they can score as little as 50 per turn. Later on in the game, players may throw scoreless first rolls. If a player does this three times in a row, she loses 1,000 points. 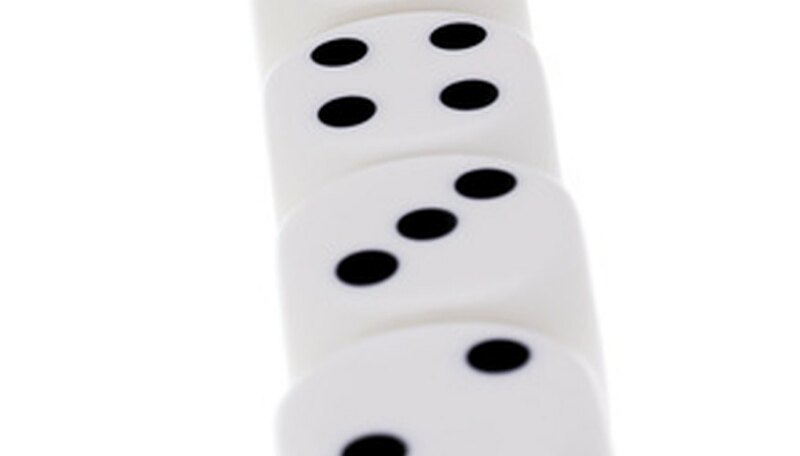 When five of the six dice are scoring, some players use the rule that they have two chances to roll the sixth die to score. Scoring with the sixth die gives the chance to roll all the dice again as well as a 500 point bonus. This bonus increases by 500 every time the player repeats this feat in single turn. Some players have a rule where six dice of the same type thrown in a single roll counts as an automatic game win.